Although developed for rivers of the Eastern Cape it has proved to be equally successful on the fast flowing rivers of New Zealand. It is best used an hour before dark using a sinking, intermediate or Floating Line. Body : Strip of Tan Mink. 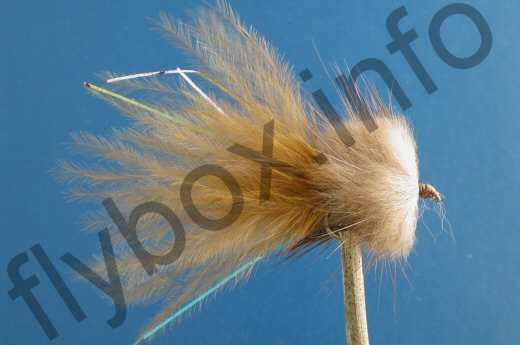 Tail : Tan Marabou with 3 or 4 lengths of different coloured strong, narrow, flat mylar/flashabou. The weight problem was solved by using beads, copper, brass, silver or gold. I started off with a a strip of mink as a tail, plus mink wound around hook for body. I wanted to represent the tadpole. However it proved to be sluggish so I substituted mink tail with long marabou adding strands of flashabou in order to get extra mobility. Currently there are no comments about the Stewarts Tan Millionaire Taddy fly pattern from other fly fishermen yet.